Wearing a helmet on a motorbike has been law in Vietnam since 2007. This applies to drivers and passengers over the age of six. Officials estimate that about 90% or riders now comply with this law and, given they save lives, you’d be daft not to wear one too. They've got falling branches covered too. If you hire a bike it should come provided with helmets, but if you’re going on a long trip or are on the cautious side it might be worth investing in your own: the helmets most readily provided might not be up to the job. 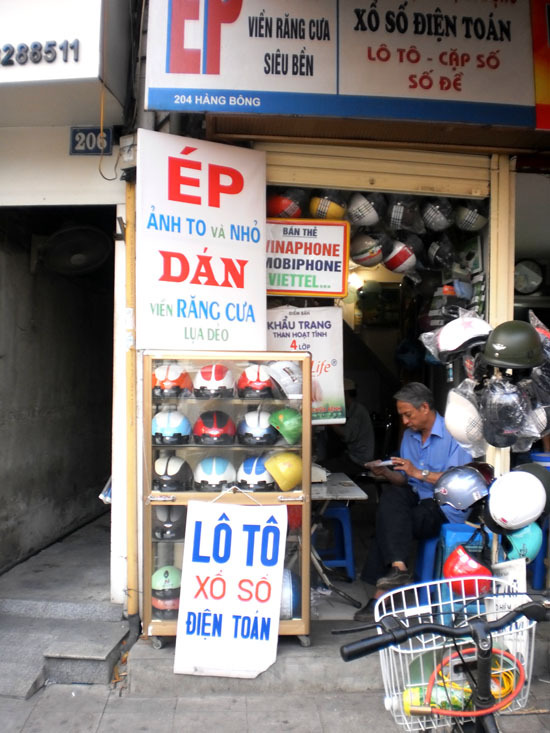 High-end helmets — of the sort you might expect at home — are not common in Hanoi, but can be found. The truly dedicated might want to try HJC Helmets, which is an exporter also selling international standard helmets within Vietnam. They have two retail outlets: one out of the centre in Cau Giay district and another in Ba Dinh, not too far from the Botanical Gardens, though I’ve read reports about a lack of large (Western) sizes. Prices run from around 250,000 VND up. Protec is a more common choice among expats as they are reasonably priced and while not racing helmet standard certainly provide a higher level of protection than the standard Vietnamese helmets you will see sold all over town. 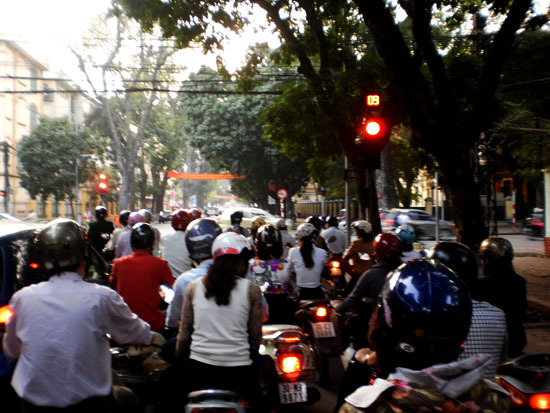 Helmets start from around 200,000 VND. You can read more on their website. They share their premises with the Asia Injury Protection Foundation. Nice touch. A colour for every outfit. As well as a decent helmet, it’s worth investing in a face mask and glasses. Hanoi has very high pollution, with dust being a particular problem: I was told by one environmental expert that the dust particles are more dangerous to health than fumes. So it pays to wear a face mask if you’re spending much time around town. It’s also worth having one on hand if you’re heading out to the countryside — you never know when you might hit a dusty spot or drive through a construction site. They also prevent the unpleasantness of bugs getting into your mouth. While plenty of unbranded masks are available for under 10,000 VND, don’t expect them to do much for you apart from offering protection from the sun, cold and bugs. It’s worth buying one of the brands on offer, the most common being Kissy, which retails at about 45,000 VND and is available all over the place. Similar brands include Lucky, AnviLife and Dr Kim. Karibon is a bit of a step up, containing activated carbon cloth and an unwoven dust filter, though of course prices are a bit higher and they’re harder to find (try Boo Skateshop on Dinh Liet). Glasses are also useful as well — for the dust and bug reasons mentioned above — although your sunnies will of course do the trick. Stalls selling basic options are all over the place, but can most certainly be found on the main roads out of town. Be prepared to haggle: we paid 20,000 VND for a pair of plastic clear glass Adidas rip-offs on the outskirts of Hanoi then my boyfriend was asked for 200,000 for an almost identical pair in Hue. He got them for 20,000. Alternatively, ‘Glasses street’ in the Old Quarter runs along the southernmost stretch of Luong Van Can and round onto Hang Hanh.